Paula Deen's English Peas "recipe"
We all know that Paula Deen is widely known for using a liberal amount of butter in her recipes. 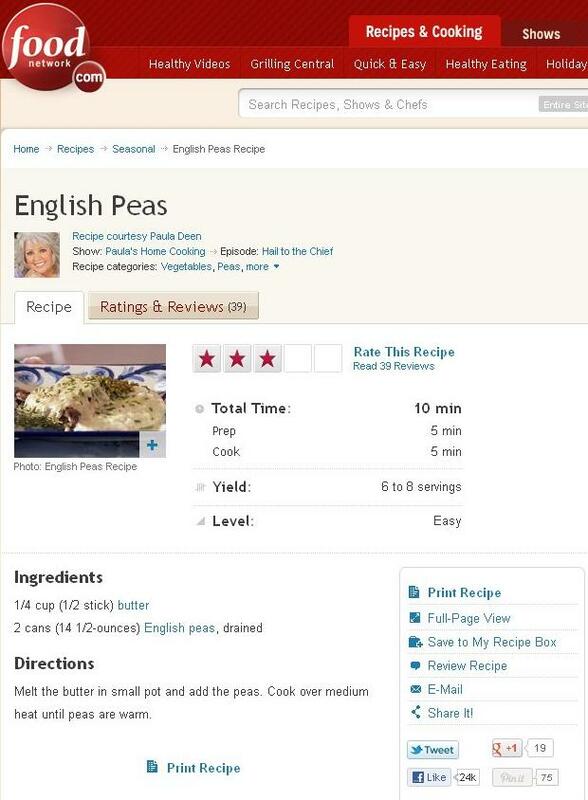 Well, here's a recipe for English peas where half of her ingredients is butter. An abridged version of the "recipe" goes like this: combine half a stick of melted butter with 2 cans of peas in a pot over medium heat. It's kind of ridiculous that there even needs to be a recipe posted for this, and it's even more ridiculous that Paula Deen is even associated with such a recipe. Well, in her defense, there are a lot of people out there who don't know how to cook and may find this recipe helpful. I've never made this recipe nor have I ever tasted English peas, so for all I know this may be the best English peas recipe out there. "I clicked on the "Print Recipe" link for this recipe, but my printer only printed out a sheet of paper that read, "Your An Idiot!" "Come On! How do you open the can??? and do I use salted or unsalted butter????" [and my personal favorite] "Incredible insight Paula. I have lived in England for all of my 49 summers and have never heard of this, UNTIL NOW! You have captured, in a bowl, the complexity, imagination and ingenuity of this proud nation." As of this post, there were only 39 comments. C'mon Food Network...some of those comments were really funny!...haha. This recipe has given us some of the best culinary comments on the internet! What happened to the other 200+?